Description of "Top 100 Diversified Undervalued Indian Stocks For FY 2018-2019"
Simply add these stocks in your portfolio and make a diversified large-cap portfolio for the long-term view. 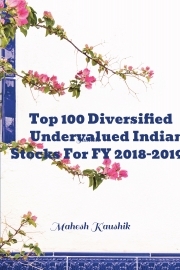 In this book, I choose top 100 undervalued Indian stocks for FY 2018-19. When you read this book, you understand that only a few companies change their position in a year so every year you need to change only a few stocks from your portfolio. So this book is helpful for those followers who have no time to research and no time to track market price of their stocks they just wanted to invest their money in blue-chip stocks and their investment horizon for 5-20 years. With the help of this book, you simply start making your portfolio with these top 100 blue chip companies, no need to check day by day price movement check once in a financial year and replace only a few companies with new entries in my sharegenius Top 100 index. Mahesh Chander Kaushik is an NISM Certified Research Analyst Registered under SEBI RESEARCH ANALYSTS REGULATIONS, 2014, SEBI Registration Number INH 100000908. Reviews of "Top 100 Diversified Undervalued Indian Stocks For FY 2018-2019"